This is precisely why we are Creating an Event that has never taken place in the history of mankind for our beloved Lord Ganesha’s birthday, “Ganesha Chaturthi”, on August 23rd! It does not matter what has been stopping your prosperity, happy relationships or your perfect health. Lord Ganesha will remove all obstructions in your path towards fulfillment. This month we are celebrating Ganesha Chaturthi (Birthday) Worldwide for the whole world to see and benefit. This has never been done before. What better way to bring. delight to this Diety than for us to Create a LIVE Broadcast for 3 Days of a Homa(Fire Ritual) and Pooja for everyone to witness and you are invited. The positive Intentions and consciousness behind these 3 days are astronomical. This year Ganesha’s Birthday celebrations fall on an Auspicious Sunday, August 23rd. Virgo, the natural sixth house signifies wealth derived from service, business and operations in an organization. Moreover the planet Ketu, which is powerful on Sundays and whose overlord is Lord Ganesha, is placed in the 11th house to Virgo (Cancer) signifying total gains and ultimate blessings to rituals performed on this day. This rare cosmic imprint occurring during Ganesha’s Birthday will help to realize your material dreams. Do You Need Supersonic Speed and Intelligence? Ganesha who is the Chief of the space Angels is an enigma. Mythologically he rides on a mouse but with supersonic speed. He once transported one of his aged devotees to heavens within milliseconds, ahead of all the people who have started before her. Ganesha is not only fast but is super-intelligent. His knowledge comes from not the mind but from the heart. Mathematical geniuses have attributed their supercomputing skills to Ganesha. You may already know many of your own stumbling blocks whether it is speaking roughly with others, attracting bad relationships, being too emotional, etc. But there are many you do not see as well. Obstacles are both seen and unseen blocks in your life. What stands between you and what you want often becomes an unknown journey. The specialty of Ganesha lies in his siddhi power of perfect seeing. He sees the obstructions that stand between you and your goal and knows how to bypass them. Even Gods and Angels pray to Ganesha to remove obstacles before beginning a task. The Amount of positive worldwide consciousness surrounding Ganesha is enormous, Imagine how much more influence there will be when you partake in these Ceremonies. In mythological times, Lord Shiva neglected to remove obstacles before he set out in a battle to destroy the 3 impurities of Tripura, namely ego, karma and maya. By failing first to use Ganesha’s powerful mantra, the axel of Lord Shiva’s chariot broke, hampering his victory. Recognizing his mistake, Lord Shiva immediately made prayers to Lord Ganesha, using his powerful seed sound mantra “Gum” at an energy vortex called as Acchirupakkam. This penance has further ignited the energy of Acchirupakkam to remove your obstacles, even if you have never thought to do it before. Because this is one of the most powerful places on our earth to remove your obstacles, Astroved is arranging for the smashing of coconuts and a pooja on your behalf on Ganesha’s Birthday at this Vortex. 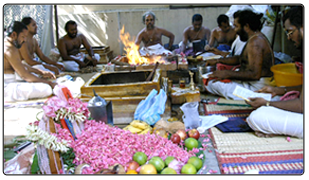 Astroved is performing these rituals at the right place and the right time just for you. 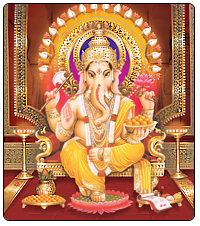 Aug. 21st Homa Bala Vidya Ganesha This Ganesha holds a mango fruit symbolizing complete knowing and foresight. It is also a childlike, innocent form of Ganesha who brings us energies of abundance and joy.We will capture the energy of this fire ritual in mango wood stautes of Ganesha with vibrations to help heighten education and increase intelligence. Aug. 22nd Homa Veera Vigna Raja Ganapati This form of Ganesha is the King of Obstacles with total command over any obstruction or blockage which is troubling us. On this day we will be energizing white erruku root Ganesha statues with energies to remove obstacles. Aug. 23rd Homa Oodchista Ganapati This is a tantric Ganesha who brings success in all activities and who can increase name and fame. He is said to give very quick results who can wade into whatever mess we may created from our ignorance in the past and get things turned around right now. This powerful energy will be captured in Neem wood Ganesha statues for success in all ventures. These rituals will commence on August 21st and culminate with an intensified Abhishekam to Ganesha on August 23rd. By sponsoring in mass numbers, we can bring miracles to this world in our troubled times. When you participate Ganesha intervenes in the current obstructions of your life. The obstacles that have been bothering you, will find resolution. We want you to derive the most benefit from these extremely powerful grand fire rituals to reshape your destiny! Astroved would cover the fire ritual LIVE on each of the three days so that you could derive full benefit of this grand fire ritual. It is also a great time to invite Ganesha to your homes with powerful custom made Neem , Mango wood and Yerukku root Ganesha statues, which will be energized for three days during the Ganesha Chaturthi ceremonies and optionally delivered to you (limited supply). Powerful ceremonies and rituals will happen in one of the most powerful Ganesha temples. Baba’s favorite Ganesha vortex is Acchirupakkam near Chennai. You could transfer your karma onto a coconut and break it at the vortex. Ganesha at that point will remove your karma. Ritual can be done by proxy. Offering coconut garlands on behalf of your families or businesses is also a great tool for protection and prosperity. Remember, these rituals are life changing, they work! Your life WILL become better, brighter and obstacle free! Background Story : Lord Ganesha (or Ganapati) was created by Goddess Parvati, consort of Lord Shiva. According to the legend, once Lord Shiva, was away at a war. His wife Parvati, wanted to bathe and having none to guard the door to her house, conceived of the idea of creating a son who could guard her. Parvati created Ganesha out of the sandalwood paste that she used for her bath and breathed life into the figure. She then set him to stand guard at her door and instructed him not to let anyone enter. In the meantime, Lord Shiva returned from the battle but as Ganesha did not know him, stopped Shiva from entering Parvati’s chamber. Shiva, enraged by Ganesha’s impudence, drew his trident and cut off Ganesha’s head. Parvati emerged to find Ganesha decapitated and flew into a rage. She took on the form of the Goddess Kali and threatened destruction of Universe Seeing her in this mood, the other Gods were afraid and Shiva, in an attempt to pacify Parvati, sent out his ganas, or hordes, to find a child whose mother is facing another direction in negligence, cut off his head and bring it quickly. The first living thing they came across was an elephant. That elephant was facing north(the auspicious direction associated with wisdom). So they brought the head of this elephant and Shiva placed it on the trunk of Parvati’s son and breathed life into him. Parvati was overjoyed and embraced her son, the elephant-headed boy whom Shiva named Ganesha, the lord of his ganas. Lord Shiva announced that everyone who worships Ganesha before any other form of God will be favoured. So Ganesha is worshipped first in all Hindu occasions and festivals. He has an elephant face and five hands which symbolize the ideal life that human beings on earth should undertake. The Elephant lives the longest as it breathes in more air than out. From a yogic viewpoint, Ganesha acts as a perfect guide for right living and breathing.